If you’re in the mood for a classic love story with just a touch of mushy sentimentality, you can’t really go past Mouna Ragam. Mani Ratnam’s beautiful 1986 film takes an arranged marriage between a compliant groom and a reluctant bride as the starting point for a look at relationships and how two strangers can learn to live with each other. It’s well worth watching for the excellent performances from the main leads, Mohan, Revathi and Karthik, but also for the simple but effective storyline and wonderful music. The story follows Divya (Revathi) a fairly happy-go-lucky student whose world is shattered when her family arranges her marriage. The groom is Chandrakumar (Mohan) and even though Divya lists all her worst qualities on their uncomfortable first meeting, Chandra likes her honesty and decides that she will be the perfect wife for him. The opening scenes add to the realistic feel of the film as they illustrate just how young Divya is, playing tricks on her older sister and husband, and showing her simplistic and childish ideas to counteract the unwelcome marriage proposal. However, against all her objections, Divya is pressured into the wedding by that age-old family drama – a threatened heart attack / medical collapse. Divya is just as susceptible as every other film heroine and without further ado her husband whisks her off to a new life in Delhi. The relationship is shown as difficult right from the start. As Chandrakumar shows Divya around his house in Delhi after the wedding, Divya’s body language makes it obvious that she doesn’t want to be there, while Chandrakumar is clearly feeling the hostile vibes but trying to be as welcoming as possible. This awkwardness seems exactly what I would expect from two strangers suddenly having to live together and Mani Ratnam has captured their uneasiness perfectly. I don’t know, never having been through it, but this seems to be a plausible reaction to the abrupt intimacy between two people who have only just met. It’s thought-provoking and one of the things I love about the film, that just a few moments can invoke such a complicated emotional response from me. Despite her classy new abode, which is a world away in size and conveniences from her family home, Divya is very unhappy with her marriage. So much so that when asked what she would like most from her new husband, her immediate answer is a divorce. This is a pivotal scene and it’s beautifully played out by Mohan and Revathi. Chandrakumar’s shock and hurt are palpable while Divya appears to be no more than a sulky school girl trying to be as obnoxious as possible. Needless to say as a rejection it works well, and since she follows it up with more nasty remarks it’s to his credit that Chandrakumar manages to keep his cool. 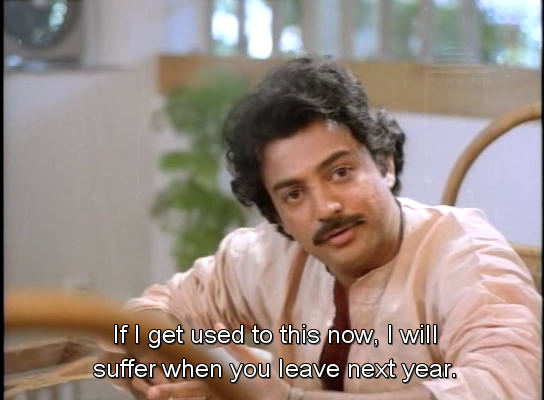 This is the turning point of the film for me with Chandrakumar’s character partly due to his emotional responses (which make me feel sorry for him), and partly because he shows more personality in interactions with his work colleagues. It’s an important change since up until this point he’s fairly bland and unexciting, making Divya’s reluctance to go through with the marriage relatively understandable. But Chandrakumar seems a good catch. He’s got a good job, a nice house and is considerate and understanding, particularly when faced with Divya’s immature taunts. With just a few simple scenes, Mani Ratnam turns the story around, and suddenly it’s Divya’s reactions and inability to make the best of things that become difficult to understand and instead of wanting her to get divorced, I want Divya to fall in love with Chandrakumar and be happy in her marriage. Eventually Chandrakumar asks Divya exactly why she is so against the idea of their marriage (possibly something he should have done before the wedding), and she tells him about her first love Manohar (Karthik), who was killed just as they were about to get married. The story of Manohar and Divya is told in flashback and although Karthik only has a small role, he’s an excellent romantic partner for Revathi and the two share great chemistry together. The difference between the two relationships stands out clearly. Divya and Manohar have a light and happy relationship, their scenes together are full of life and there is a sense of energy that is missing between Divya and Chandrakumar. Karthik is very appealing here as the quintessential ‘bad boy’ who is of course not really bad at all. However, while the romance is well told and Divya with Manohar is happier and nicer person, she also seems quite mature, which seems at odds with her juvenile responses to Chandrakumar, and her earlier carefree attitude as a student. In the face of such strong contempt from Divya, Chandrakumar tries to arrange a divorce, but the law states that the couple has to be together for a year before they can apply. Naturally over this time Divya comes to see the good side of Chandrakumar and slowly develops feelings for him, while Chandrakumar gets a little of his own back by throwing her earlier remarks back at her and ignoring her attempts to be more friendly. This being a Tamil film it’s not guaranteed that there will be a happy ending, and the developing relationship is compelling viewing as the deadline for the divorce looms. There is so much to enjoy here. Revathi is excellent in her role as Divya and her self-realisation and development of maturity is captivating. Initially she lets her emotions track across her face just like any young girl and her petulance and hostility is perfectly nasty. 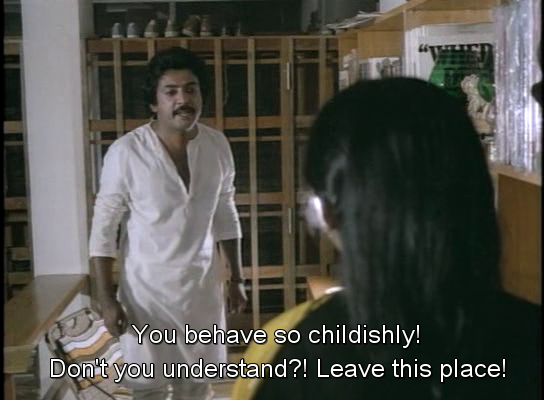 Just think of how obnoxious any group of schoolgirls can be – that is exactly what Mani Ratnam has captured here. With Divya’s slow acceptance of her husband there is a softening of her expressions, and when the realisation of what she has done sinks in there is maturity in her actions too. However she is still a young girl at heart, as shown by the tricks she plays on the driver Sanjit Singh. I love the way Mani Ratnam emphasizes her isolation by moving the couple to Delhi where Divya cannot understand the language and is confused by the cultural differences. It adds to the problems she has and ensures that she has to resolve her problems by herself. There is no convenient family or friend to help her, although the lack of interference from Chandrakumar’s family is a little surprising. Mohan is just as good and although his Chandrakumar initially seems too perfect to be true, he becomes more human and therefore more likeable in the second half. He does an excellent job of portraying a ‘nice guy’ and has just the right amount of revenge on Divya without becoming cruel or spiteful. He’s an ideal contrast to the passion of Karthik, and I kept thinking of the old proverb ‘still waters run deep’ when the camera focused on Chandrakumar’s patience and tolerance. Although the story is nothing new it’s beautifully told using a simple style with well developed characters and situations. As an added bonus the music by Ilaiyaraaja is excellent and this song Nilaave Vaa, sung by SP Balasubrahmanyam is just beautiful. Mouna Ragam rightly deserves to be called a classic and despite the fact that I know what is going to happen, I get drawn into the story every time. Each character is perfectly drawn, the actors all fit their roles easily and there is none of the overblown melodrama which usually infects similar love stories of the time. It’s one of my favourite romances, and I thoroughly recommend watching. 5 stars. This entry was posted in Kollywood and tagged Ilaiyaraaja, Karthik, Mani Ratnam, Mohan, Mouna Ragam, Revathi, Revathy, SP Balasubrahmanyam, Tamil. Bookmark the permalink. There’s something about this movie that works for me everytime I see it, and I must have seen it over a dozen times. The way the characters interact, the music, all adds up. One of my all time favourites. Still ranks as one of my Manirathnam favourites. Have you seen Manirathnam’s first movie ‘Pallavi Anu Pallavi ‘ in Kannada, not as well crafted but again is a simple story about relationships with good music and Bangalore city captured when it was a garden city! I haven’t seen his first film – I haven’t been able to track down a copy yet – maybe someone will re-release all these great films on DVD with English subtitles one day….. However, I did like the film. Very much. 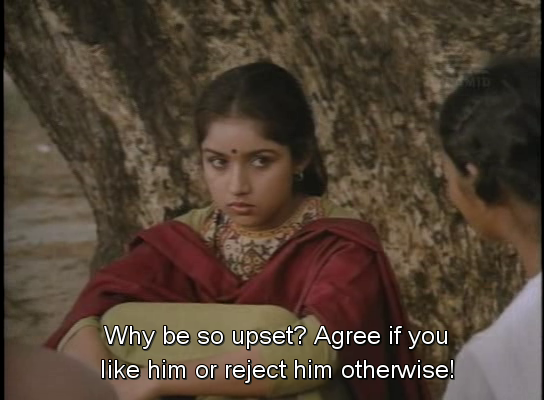 My only peeve (and it *is* only that) is that Revathi’s character was rather inexplicable – if she was so in love with Manohar, and so much in grief at his death that she turns into this sulky, unhappy girl when she is married, what on earth was she so bubbly (*too* bubbly!) for earlier on (in the scenes before she got married)? You don’t suddenly turn into grieving widow, no? All that said, Mani’s forte was his deep insight into the man-woman relationship, in a cultural milieu that he is familiar with. I wish he would go back to that instead of this cross-over that he has been attempting. Kannathil Muthamittal was the only one of his ‘recent’ films that reached the standards that he himself had set. We are on the same page regarding the bubbly student who was apparently a woman in mourning! I completely agree. I have been looking for a copy of this film (with English subtitles) for years! Where did you find it, if I may ask? I love Mani Rathnam’s films. Nice review! It’s an awesome movie – I hope you find it. I ended up downloading this one as I couldn’t find a copy with subtitles anywhere else. From memory I just googled the title and English subtitles. Sorry I can’t be be any more help. One of my Mani Ratnam fav movie. Everything is too good in the film and nothing is overdone. I think the best part was Revathi shown as a bubly girl in the opening scenes. She doesn’t necessarily have to be brooding. And I think its pretty much difficult get on with a new guy in a new place. Its pretty hard too. That explains her characterization in the later part of the film. And Mani Ratnam always gets the best out of his Technical team. The Music is amazing my fav being ‘Mandram vandha thendral’ the Mastreo Ilayaraja at his best whose 1000th film is hitting the Screens tomorrow. And there is PC Sreeram with his beautiful Cinematography. After first two films one in Kannada and Malayalam not doing well at the Box office even though they were good, Mani Ratnam came up with this Classic film being his third Directorial. 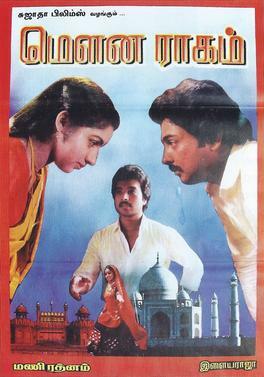 This was actually Mani’s fifth directorial, third in Tamil. A good write-up on one of the finest movies made on relationships. All the characters were good, especially Revathi and Karthik. To my knowledge, she never had an older sister in the film. It was actually her brother and sister-in-law. Did you know, this film was inspired from Mahendran’s Nenjathai Killathey, which was a classic in its own right. 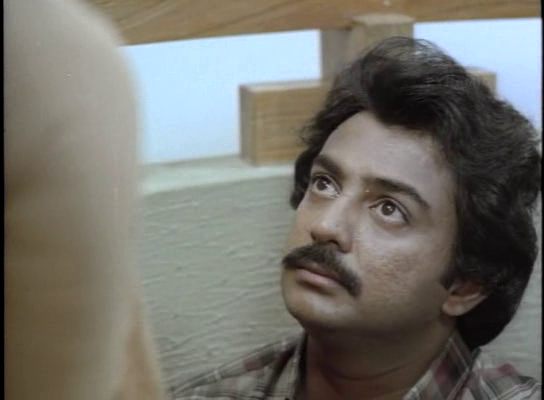 Mohan, who originally played Karthik’s character in NK, had a character switch in this film. Incidentally, both the films won a National Award in the same category, over a six-year span. This film gave a much needed breakthrough for both Mani and PC. In fact, Mani in his Conversations with Mani Ratnam says this was the first film that gave him the freedom to experiment and satisfaction of having made a good film since Pallavi Anupallavi. Thanks. 🙂 The perils of relying on subtitles and the use of the word ‘sister’ to refer to more than just your actual sister! Thanks for the back story about the film too – I didn’t know that Mohan also appeared in Nenjathai Killathey. Thanks for your comment and kind words 🙂 It can take a little time to approve depending on the time here in Australia, but both came through fine. This is such an excellent film – and definitely one to watch with a convenient box of tissues – just in case! Glad you love it too. Not sure why comment is not getting posted. I will try again…just wanted to say the review is great. I watched this movie in telugu countless number of times and every single time I watch the whole movie. Truly a classic.